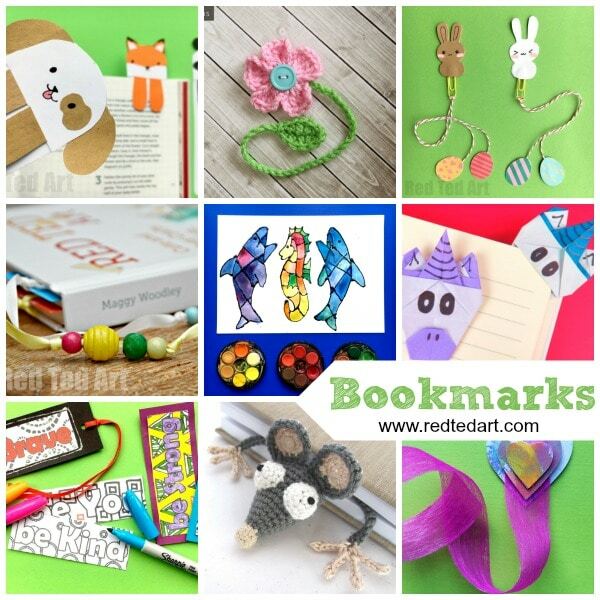 As you know you we are bookmark MAD here on Red Ted Art. 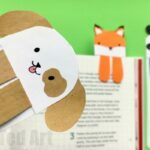 We love bookmarks, because they are a (usually) quite simple to make, there are so many different bookmark designs you can create, they are practical and useful and they also make great little gifts. 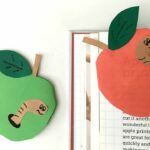 Bookmarks are a great little craft to fill 5 – 10 minutes here or there – whether in class, at home or during the looong summer holidays. They are perfect for bookworms and great for middle school and marking all your relevant study pages. Boomarks are simply FUN. 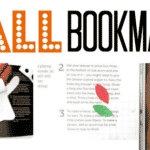 So, although we have a rather extensive and ecclectic range of Easy Corner Bookmark Designs for you to browse, I wanted to have a specific section dedicated to “other” Creative DIY Bookmark Ideas. 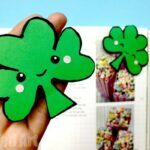 Though of course paper bookmark Ideas rock, there are so many different ways to make bookmarks – from paper clip bookmark ideas, to knitted bookmark ideas, to pom pom bookmark ideas.. or combining bookmarks with favourite photographs or topical themes. 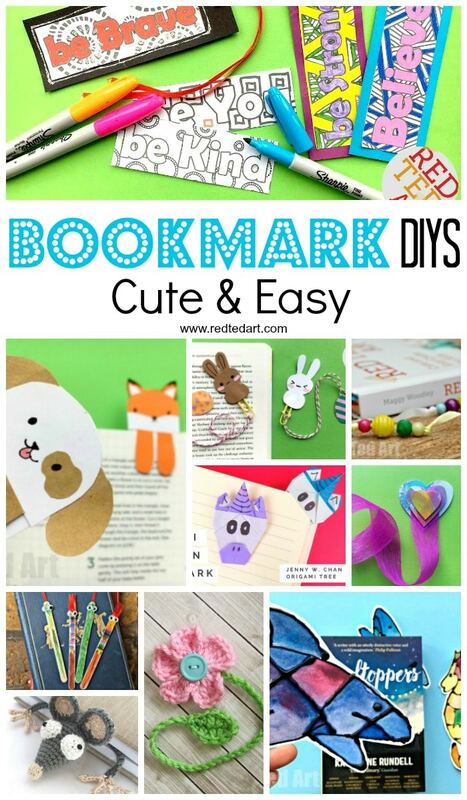 So here we go… MORE of our favourite Red Ted Art DIY Bookmark Ideas JUST FOR YOU!!! 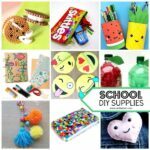 Whilst on the topic of School Supplies and “Stationery”, you may also LOVE our Pencil Holder Crafts – quick and easy and a great way to organise your desk! As with many of our “collections”, do bookmark (hehehe get it) this page, and be sure to come back in future, as we update and add to this regularly!! More ideas JUST FOR YOU! Needless to say when you say Paper Bookmarks, I say “corner bookmarks“, but of course there are many more ideas than that! And finally we have an UTTERLY GORGEOUS Hug a Book Mermaid Bookmark DIY too! Gorgeous How To Train a Dragon Bookmark – isn’t he darling? And these easy Origami Ghosts would make FABULOUS bookmarks too. Just pop them over your book like a “hug a book” bookmark! Similarly you may LOVE these Black Glue & Watercolour Leaf Bookmarks. The matching acorns are just too cute! 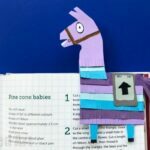 And you simply have to check out these amazingly cute origami unicorn bookmark! 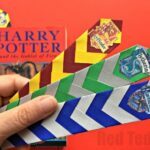 Fabulous Paper Chevron Harry Potter Bookmarks – love how smart these look! Double Sided CUPCAKE Bookmarks, to print colour and a lovely tassle too! I adore these oh so cute Easter Paper clip bookmarks – the little cute bunny & Easter Eggs are just darling! And of course, if your kids are not too old for this, who can resist some adorable Footprint Bookmarks? 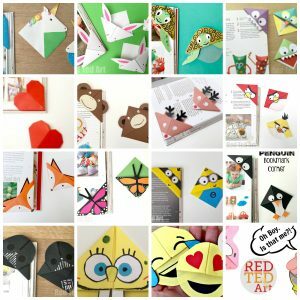 And now.. you can of course hop over to our Easy Corner Bookmark Designs for yet more paper craft inspiration! 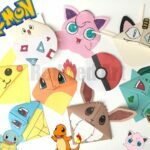 Great DIY ideas and specially your bookmark collections are very impressive. I will surely implement it for my kids.